By 2 a.m., the party at Thalassa, a waterfront bouzouki club in the exclusive Athens suburb of Glyfada, is finally getting going. All evening, Porsches, Mercedes and BMWs have been rolling up to the door, disgorging men in coats and women teetering on stiletto heels. Inside, the queen of Greek pop, 40-year-old Despina Vandi, sings onstage. The cost of admission is a bottle of whiskey per table  at a minimum of €170, about $200  and patrons shower the entertainers with pricey white carnations, bought by the basketful from young women working the floor. Behind Thalassa's doors and those of dozens of other bouzouki clubs dotted around Athens, Greeks can still spend big  if only for one night. Outside, reality is bleak. Flush with wealth only a decade ago, Greece is now drowning in debt and has been forced to go begging to Europe for help. In return, the government has promised a range of cuts, sending outraged citizens into the streets. On Thursday, May 20, the city saw its second major protest  this one peaceful, unlike the one on May 5 in which five died  along with a 24-hour strike that shut down schools, businesses and public transportation. If someone were looking for a symbol of the excesses that led to the country's financial crisis, they need look no further than the culture of bouzoukia, a uniquely Greek celebration of the good life. As the crowd in Thalassa cheers the thumping, high-wattage show, a mix of local pop and international hits (with only a token bouzouki, the mandolin-like traditional instrument that gives the clubs their name), Greece's economic woes seem far away. That's precisely why people come. Giorgos Papadapoulos, 28, is a bouzouki regular. He used to come to the clubs three or four times a month, but in April he lost his job as a bus driver ferrying people to a local casino. "A month ago I had €2,500 [$3,000]. Now all I've got is this," he says, pulling €5 out of his pocket. "I don't know what I'm going to do tomorrow." Tonight he can't afford a table, so he's standing in the back with his platinum-blond girlfriend on a €15 ($19) bar ticket. But he claims to have no regrets about spending his euros on entertainment, saying with a wry grin that he realizes it's this attitude that got Greece into trouble. "It's because we don't save," he says. "Whatever we have, we spend." Across town, tucked next to a Saturn dealership in a seedier district, the club Skyladico VIP  literally "VIP doghouse"  is less glamorous, a little more sexed up. Eighties haircuts abound, and even the male singers glitter. But a table, with the compulsory bottle of whiskey, still costs €130 ($160). Giorgos Marinis, the club's headlining star, is a bouzouki veteran, with 25 years on the stage. He points out that the clubs date back to the 1950s, when Greece was still a poor and tumultuous country on the fringe of Europe. People came for escape, to display their wealth and to seal deals. "It's something that's so basic," he says of singing and celebration. "It's just central to the Greek soul." In the 1990s, the clubs got bigger and the performances slicker, becoming more like Vegas-style shows featuring local pop stars. The transformation was a reflection of the times: Greece's economy was booming, buoyed by European Union membership and the expansion of consumer credit. New clubs sprouted around the city, from warehouse-size venues to hole-in-the-wall neighborhood joints, and many once poor Greeks began splurging on designer clothes, expensive cars and over-the-top entertainment. 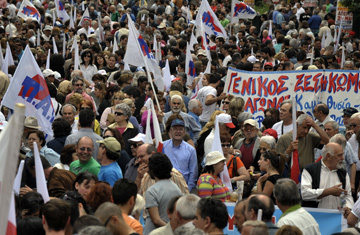 A 2008 Nielsen report listed Greeks as the world's most brand-conscious people. But that boom was fueled in large part by easy credit and untaxed money. "There's a lot of black money in Greece," says Marinis. "This is where it was spent." Now the bill has come due. As the government tries to fill state coffers, it is cracking down on tax evaders and has the entertainment world in its sights. Having already named and shamed 57 doctors accused of not paying their taxes, the country's Finance Ministry is preparing a similar list of high-profile entertainers and other celebrities. But even Greece's favorite form of late-night escapism isn't immune to the effects of the recession. Big clubs like Thalassa used to be open seven nights a week; now they are open only on the weekends. Tradition dictates that on an evening out at a club, the host treats the guests at his or her table and pays the bills in wads of cash. These days, many patrons split the bill or buy the cheaper bar seats. Still, Greeks are adamant that the singing and celebration will continue. At Thalassa, 24-year-old student Athanasia Panagoupoulos sings along to pop star Vandi's performance and says that despite the crisis, Greeks will always find ways to have fun. "You still need to go out," she says. "People still need to live their lives beautifully."